SWEAT is a loose collaborative dedicated to the creation of socially conscious videogames. It is founded and directed by Rafael Fajardo. SWEAT 3.0 was convened to create Sow/Reap and consists of André Blyth, Esteban Fajardo, Teri Galvez, Tommy Hoffmann, Ben Lehr and Rafael Fajardo. Ben Lehr is an environmental activist who has been collaborating on the creation of videogames with Esteban Fajardo and Tommy Hoffmann since they were all in high school. Their team, Los Pinguinos Perdidos won the gold medal for videogame design in the Scholastics Art & Writing national competition. Rafael Fajardo has been exploring the expressive potential of the videogames through his creative work. He is the founder of SWEAT, a loose collaborative that pioneered the creation of socially conscious videogames, which have been exhibited in museums and festivals world wide. Fajardo has been engaging in collaborative interdisciplinary research concentrating on learning through game-making. His projects have been funded by the National Science Foundation, the National Endowment for the Humanities, and by the Colorado Council on the Arts, altogether in excess of one million dollars. I.D. Magazine named Fajardo one of the top fifty designers in the country in 2004. He currently serves on the Board of Advisors of the International Digital Media and Arts Association, and on the Board of Advisors of Games for Change. Rafael received an MFA in Graphic Design from the Rhode Island School of Design, a BFA and a BA from the University of Texas at Austin. 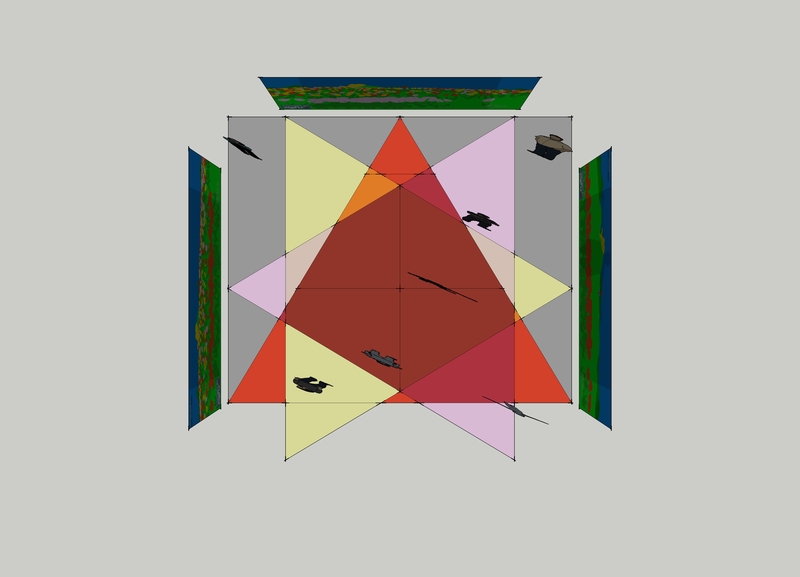 We propose to install Sow/Reap in an available space in the Currents 2015 New Media Festival. Our minimum space need is 20’x20’x10’ clear of any obstructions. We know that this is a big space, and a big ask. Sow/Reap is multi-player interactive game-like experience. Depending on the configuration we can handle up to eighteen simultaneous participants (in the smallest configuration). People can enter and leave the experience at will. Gameplay can be learned in roughly 30 seconds, and we’ve had groups play for an hour in testing. 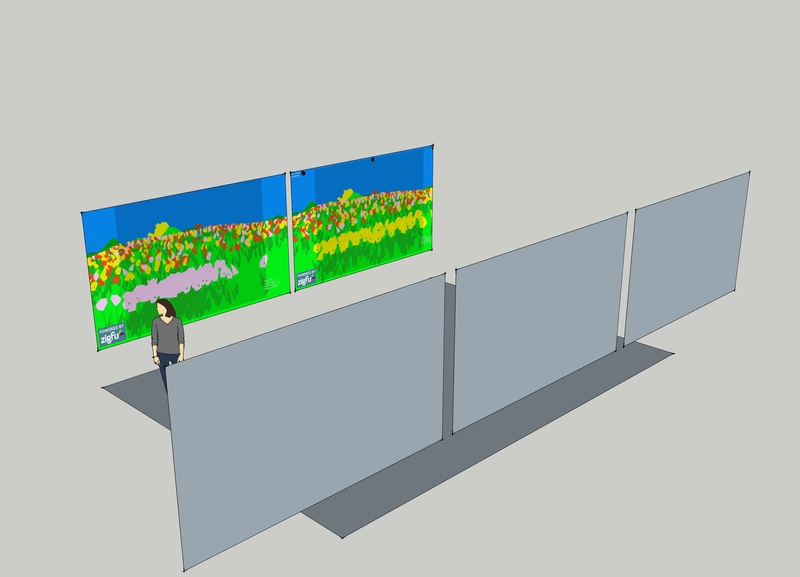 Sow/Reap is a “big,” multiplayer, game-like experience of sowing and cutting down poppies. Sow/Reap metaphorically comments on the War on Drugs through game play, through the mechanic that gives players the option to either plant or to eradicate poppies. Sow/Reap contributes to the historical dialogue of visual art by offering a space for the participatory creation of landscapes. It is “big” in that it requires a large space for the minimum installation of three networked play spaces (playscapes). These can be non-contiguous, contiguous, or overlapping. Sow/Reap is scalable up from this minimum installation. It makes use of Kinect sensors to enable up to six players per play space. The players interact with Sow/Reap via a “T” gesture, one that increases the width of the bounding box surrounding their data shadow. The players’ presence in the game world is signalled back to them through the projected display of this data shadow captured by the Kinect. Sow/Reap is a stable, playable, experience. We expect that the enabling technologies may change, and that features that affect gameplay and narrative may be added. Further, different installation contexts may (and will) influence the “shape” of the game itself. Each installation will be different. Sow/Reap inhabits several conceptual spaces, and it invites players to play differently than common off-the-shelf games do. Sow/Reap contributes to the historical dialogue of visual art by offering a space for the participatory creation of landscapes. This is an ironic outcome. In trying to make a game that would work in a museum context, we end up “painting” pastoral landscapes. Sow/Reap inhabits a conceptual space that is game-like. It is a play-ground or a play-scape. As such it presents affordances that shape the potential for play within it. Sow/Reap does not have an explicit goal. It affords the opportunity for players to sow and to eradicate poppies in a field. Competition may arise as participants pursue diverging goals. Sow/Reap is a “big” game, it occupies significant physical space. It has been envisioned and designed to be projected at such a scale as to envelope a human body, to envelope many human bodies at once. The minimum height of the display is intended to be nine feet (9’). Sow/Reap is a multi-player experience. Sow/Reap responds to a single player, but is activated by the presence of multiple players. Children, especially, delight in the space, and their presence helps Sow/Reap to shine. With Sow/Reap we attempt to explore “natural,” gestural interface with games, as we explore the technical and conceptual challenges that a museum going public could pose. We take Ian Bogost’s recalibration of “casual” games to heart in recognizing that this audience may not enter into a committed relationship with this game. Still, we hope to enter that audiences consciousness within a short amount of time. We understand that a typical museum goer may give as little as thirty seconds to a work in a museum context. We have therefore attempted to work within this tight time constraint for the learnability. Sow/Reap is a “big,” “physical,” multiplayer, game-like experience of sowing and cutting down poppies. Sow/Reap comments on the War on Drugs through the game play. Sow/Reap offers a space for the participatory creation of landscapes. It is “big” in that it requires a large space (20′ x 20′ x 10′) for the minimum installation of three overlapping, networked, play spaces. Sow/Reap is scalable up from this minimum installation. 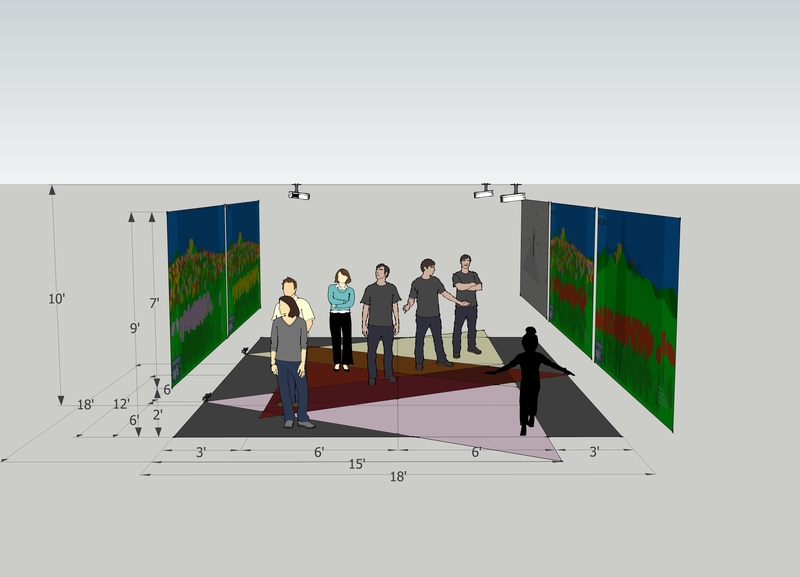 It is “physical” in the sense that it makes use of Kinect sensors to enable up to six players per play space. The players interact with Sow/Reap via a “T” gesture, one that increases the width of the bounding box surrounding their data shadow. The players’ presence in the game world is signaled back to them through the display of this data shadow, or data reflection, captured by the Kinect. Sow/Reap comments on the War on Drugs through the game play. Conceptually, poppies are beautiful flowers that grow like weeds in a variety of biomes across Afghanistan, Colombia, and the United States. 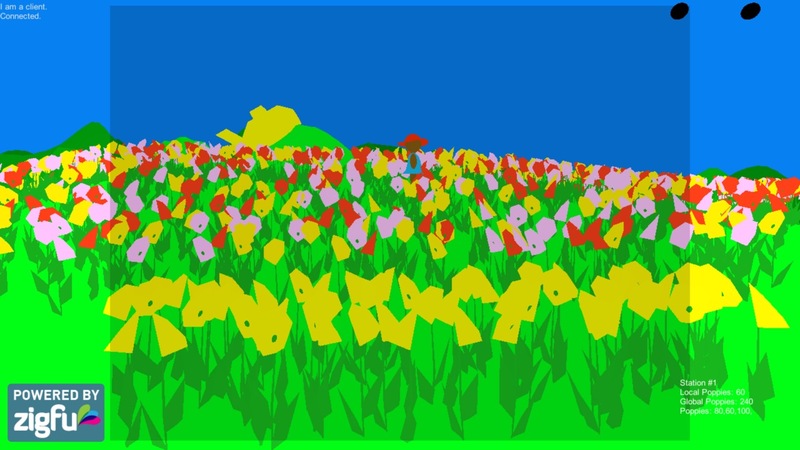 When the player chooses to plant a flower they will add beauty and color to the game landscape. When a player chooses to cut a poppy they reduce the beauty of the landscape. We made Sow/Reap with an Art Museum as its intended venue. Musems and galleries pose interesting challenges for game installations. We created this prototype with commercial off the shelf hardware to show the gameplay to curators. We have built a scalable framework with this hardware. We can install this version of Sow/Reap in a variety of spaces. 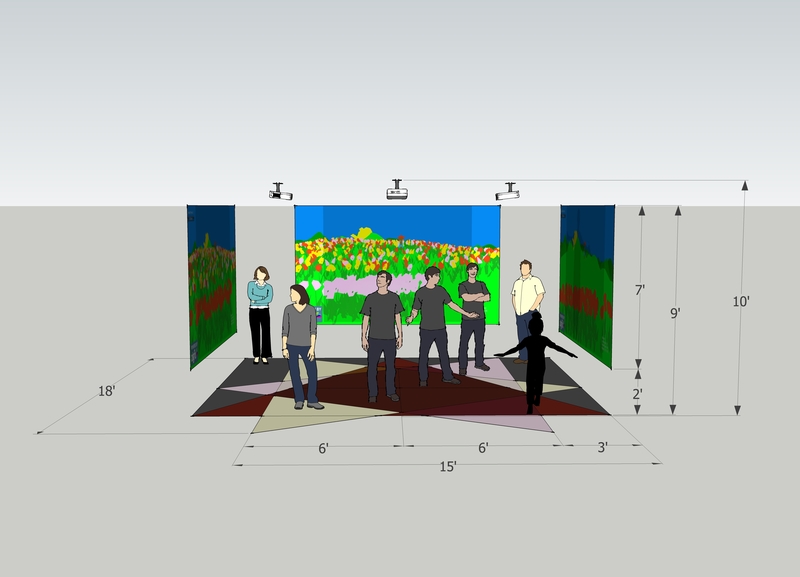 Sow/Reap is played by walking into the installation space and striking a quick “T” pose and then relaxing from that pose. The distance from a player to a projection screen determines the outcome of this action, farther will plant a poppy, nearer will eradicate a poppy. This is the core mechanic. The installation is made up of a minimum of three networked play spaces, which have overlapping fields of play — or intersecting zones of sensing. Hence, a gesture in one field will have unintended consequences in another of the fields. Sow/Reap was created by SWEAT 3.0, the third version of a collaborative dedicated to making socially conscious videogames. We did not overcome any hardships to make this game. We had the privilege of time and the luxury of space and equipment with which to imagine and prototype a large-scale installation. We had the support of colleagues and families to explore. We took these advantages seriously and have tried to make something worthwhile at the intersection of Art and Games. We’ve tried to craft an experience that can be appreciated in a short amount of time, and that will resonate in participants minds for a large amount of time. We’ve tried to think about the meaning of gestures and of their unintended consequences. We’ve tried bring a little bit of beauty into the world, while maintaining a critical edge. SWEAT is a loose collaborative dedicated to the creation of socially conscious videogames. This iteration is comprised of André Blyth, Esteban Fajardo, Teri Galvez, Tommy Hoffmann, and Ben Lehr. It is directed by Rafael Fajardo. SWEAT gathered to work on Sow/Reap during the summer months of 2013, borrowing space from the University of Denver (DU). Teri worked on the visual art; André, Esteban, Tommy, and Ben worked on game design and code; and, Rafael behaved as creative director and producer. Sow/Reap is a “big,” multiplayer, game-like experience. 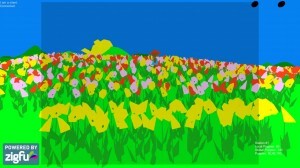 Players standing in front each screen can choose to grow, or to eradicate poppies by their gestures and by their position relative to the screen. Screen capture from one of the playscapes of Sow/Reap after it has been planted with poppies. The yellow flowers in the foreground represent the ones planted in this play-scape. The pink and red flowers in the background represent flowers planted in other playscapes networked with this one. Screen capture from one of the playscapes of Sow/Reap showing the data shadow, or data reflection, of a player as they strike a “T” pose. 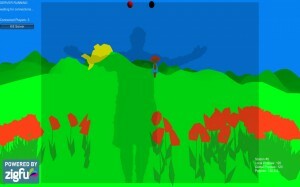 The gesture will either plant or cut down the poppies depending on the player’s distance from the screen. A new flower’s growth is quickened if a player stands still in front of it. The lack of poppies in the background of this image indicates that no players have planted poppies in the other playscapes networked with this one. a clear space 20’ wide x 20’ long x 10’ high, free of pendant light fixtures and the walls must be free of doorways or windows. 20 L x 20 W x 10 H are the minimum space needs. Within this spatial envelope we have tested two configuration options. One configuration is that of a passageway, and another is that of an open-sided cube. The passageway is ideal for spaces that have circulation on two opposite ends. 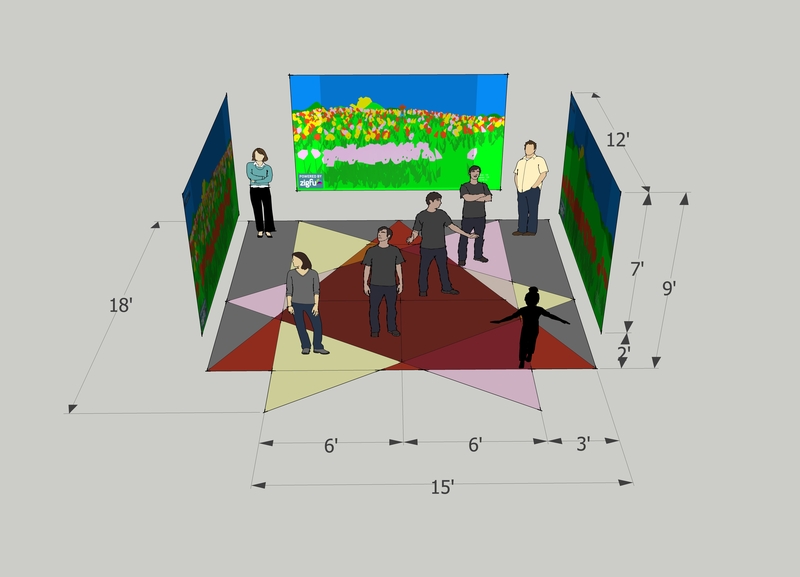 Participants can pass through the space and linger to participate or observe. The open-sided cube is ideal for a space with a single entrance-egress. If larger spaces are available we can outfit the frames for rear-projection and so the work can be appreciated both from within and without. 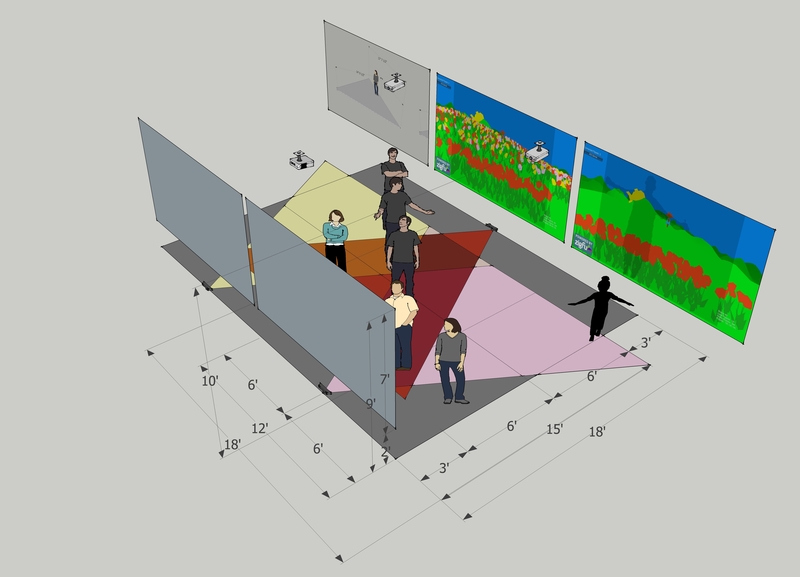 Sow/Reap is built in Unity and the current proof-of-concept build makes use of ZigFu, OpenNI, nite2, to communicate with Kinect for PC sensors. Sow/Reap (working title) play test video 00 03 1080 from Rafael Fajardo on Vimeo. Sow/Reap is a “big,” multiplayer, game-like experience, made by SWEAT. SWEAT is a loose, ad hoc, collaborative dedicated to the creation of socially conscious games. A third instantiation of SWEAT was convened to work on this project during the summer of 2013, and again during the summer of 2014. We hope this submission meets with your approval.